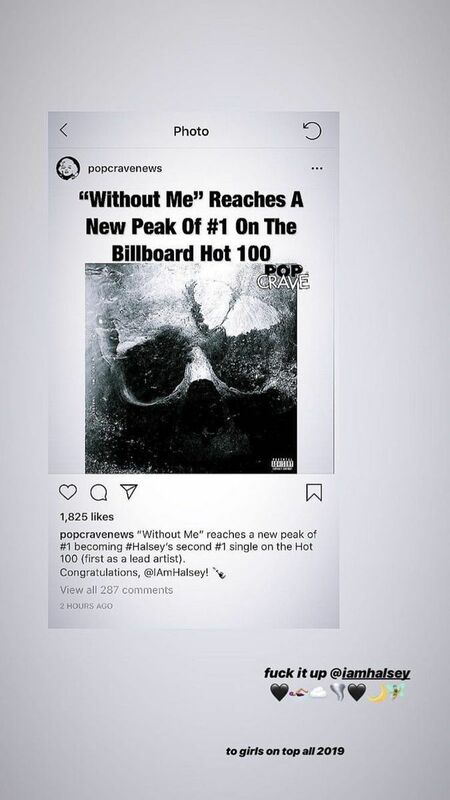 After seven weeks at the top of the Billboard Hot 100 singles chart, Ariana Grande's "Thank U, Next," a follow-up to her hit album Sweetener, has finally fallen to number two while Halsey's "Without Me" has risen to the #1 spot. Grande's reaction to Halsey usurping her throne was anything but competitive, however. Though Halsey had a #1 billboard hit alongside The Chainsmokers for her performance in "Closer," this is the first time she's topped the charts as a solo act. 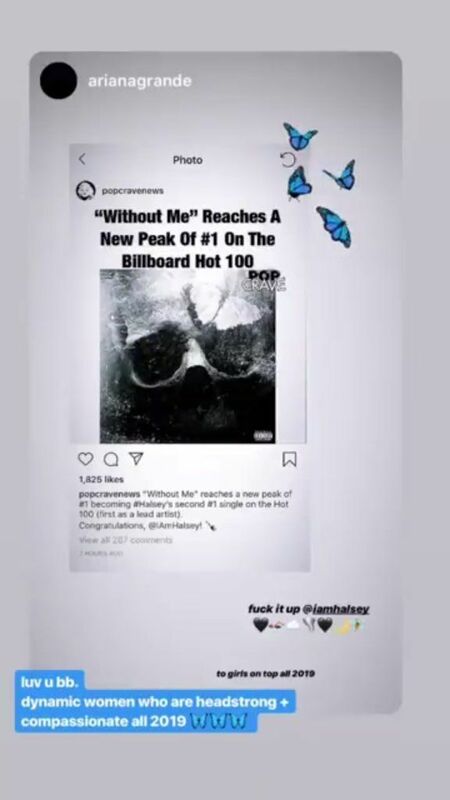 "#1 on billboard. wow. very overwhelmed and confused and so very very very VERY happy. This song came from a very lonely place, and brought me to one of the most loved and supported moments of my lifetime." "This achievement is completely beyond my means of comprehending right now so I'll get back to you guys when I find more eloquent and compelling things to say. Right now my brain is a washing machine of emotion. On a very high cycle. I love you very much." Instead of throwing shade, Grande took to social media to show her support for Halsey. "F*ck it up @iamhalsey. To girls on top all 2019." "Luv u bb. Dynamic women who are headstrong + compassionate all 2019." Twitter loved the supportive relationship between the two pop stars! You're not just imagining the girl power dominating the Billboard music charts. When Mariah Carey's "All I Want for Christmas Is You" rose to number three during Christmas (as it does annually), it marked the first time since 2014 that the three most popular songs were performed by female artists. Both Ariana and Halsey's songs happen to be about famous break-ups as well. ...but Halsey takes a different tack. "Without Me" is available here. "I'll tell you what. It happened when I looked at my relationships all around me." "All of them – cause this song is not just about one — and it made me sit down and go 'I feel like I've given so much to relationships with people in my life and I'm getting nothing back'… and so I cut a lot of people out of my life." "Some temporarily, obviously, because G and I are back together. And some permanently." Since recording that interview, Halsey and G-Eazy have broken up once again. In our modern day and age, Ariana and Halsey know there's no need to be competitive with each other when both ultra-talented women created great songs that the whole world's into. There's plenty of love to go around!